This past Thursday, I visited New Brighton, Pennsylvania for the very first time. More specifically, I visited Grove Cemetery in the hopes of finding my 3x great and 4x great grandparents. I’ve been to and through Pittsburgh on a number of occasions, but never visited Beaver County before now. The Devinney family that I was searching for has never been high on my research list. The nearest relative being Annie Elizabeth Devenny (the spelling seems to vary with every generation), my 2x great grandmother on my dad’s mom’s mom’s side. When I arrived in New Brighton, the fog had lifted but the morning remained cold and wet. It didn’t take long to find the cemetery. Using plot numbers found on Find-A-Grave, it didn’t take long to find the section where my family should be. Without a map of the lots, I would have to walk the hillside rows until I found them. No Devinneys. Grove cemetery is hot huge at 30 acres, but it’s far from small. I resigned myself to walk every row in every section (which weren’t clearly marked) until I found them. Hours later, I was climbing back into the car with my collapsing Totes umbrella, mud-caked Muck boots, and the camera around my neck. I had found a few Devinney graves, but no directs. Thinking I’d drive back empty handed, I checked my iPhone one last time and found an email from the caretaker asking me to call. I’d emailed him the day before but he hadn’t responded until I was already walking around the place. When I explained to him that I was at the cemetery he agreed to come by and meet me in the caretaker’s house. There we poured through some 150 year old ledgers and located every Devinney burial at Grove Cemetery. I photographed the pertinent ledger pages. He also handed me a small pile of section maps with numbered lots. I thanked him for his time and returned to the car. After entering all my new information into a spreadsheet, I then used the maps to plan my second trip among the stones. I returned to Section D and counted right to left until I found (what I thought was) Lot 15. Single lots had multiple stones, so it wasn’t as simple as I first assumed. Initially, I found an empty plot of ground and assumed the worst, no stones. It was raining heavily by then, so I returned to the car to look over the maps once more. It occurred to me that maybe I was looking in the wrong place. From the car window I spotted another gravestone with the surname “Dickey”. That triggered a much needed light-bulb. The pages I’d photographed were all the early burials for surnames starting with D. I combed back through the page images until I found the Dickey burial. Once I knew which Section and Lot the Dickey stone was in, I discovered I was looking in the wrong row and was three lots to the right of where I should be. I grabbed my umbrella and camera and dashed back out into the rain. I wish I could say that my adventure ended with an overturned stone (of which there were many) that I was able to tip over and find the name and dates for my 4x great grandfather perfectly emblazoned in clear letters and dates. That didn’t happen. What I found were two plinths, presumably belonging Percifer Devinney and his wife Rachel Ann. I stood staring at them for a moment, wondering how I could possibly know for sure that this was the correct place. That’s when I saw the points of a bronze star sticking out through the leaves. 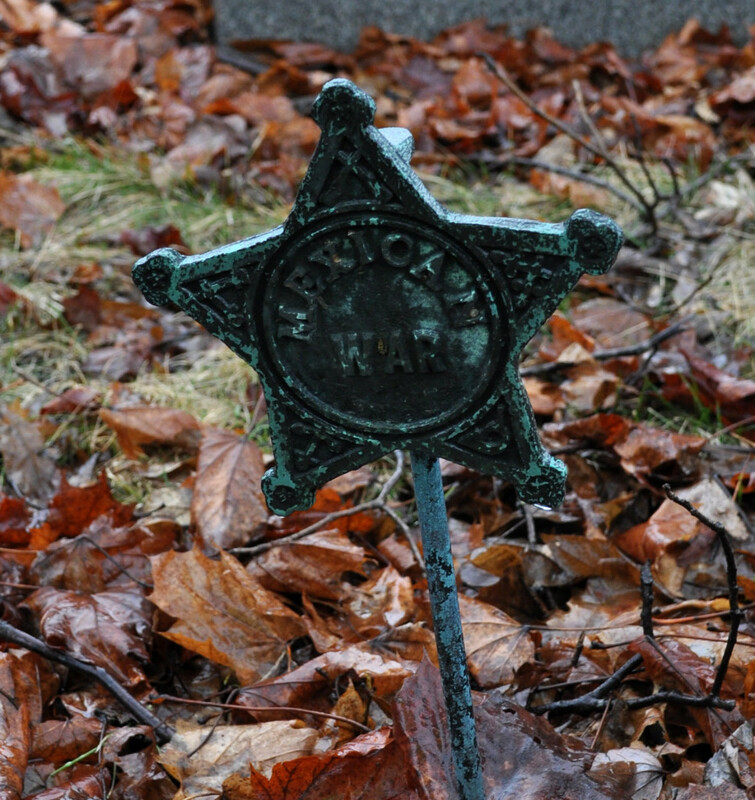 Brushing the leaves aside I found a Mexican War marker, the only one I had seen throughout the cemetery. Percifer was a career soldier, enlisting for service in 1829, 1834, 1840, and a five years span between 1844 and 1849. After his service, he returned to Beaver County, married Rachel Ann and worked as a laborer until his death in 1875. Percifer, his wife Rachel, their son Pierce, and daughter-in-law Sarah are all buried in the same lot. If not for a small bronze star, I might have walked over them without ever stopping to say “Hello”.